Solution: An ideal gas is allowed to expand from 7.60 L to 72.2 L at constant temperature. By what factor does the volume increase? The pressure will increase by that same factor. decrease by that same factor. If the initial pressure was 107 atm, what is the final pressure? An ideal gas is allowed to expand from 7.60 L to 72.2 L at constant temperature. By what factor does the volume increase? The pressure will increase by that same factor. decrease by that same factor. 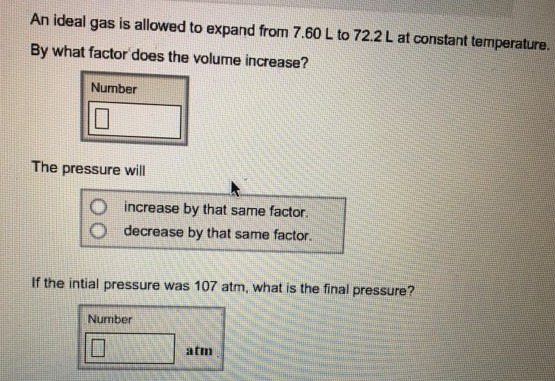 If the initial pressure was 107 atm, what is the final pressure?